You cannot really fault either player for playing so much theory, or exercising so much caution. But I cannot agree more with those prognosticators who say that twelve games to decide the champion is not enough. Of course if, for example, there is a single decisive game--if not two--in the first five or six games, then this leaves six games within which to gain an edge. Thus, if there are wins by both players, then in six games with would be a 3-3 score--four draws, two wins. And if for example there was a single win in five games (3-2 score, one win, two draws), this leaves seven games to gain a win back to get to even or score two wins, to be champion. There are many possibilities, and these are just two. But now consider the impact of just three decisive games in twelve. One person wins two games, the other player wins just one, and you get to call them World Chess Champion? Hugh? If you know what happened today, at game five, all solid, respectable games, for sure, then you know five draws have occurred so far. This means just seven games can determine a champion. Imagine one win, and six more draws. I am not saying draws are bad. Not hardly. Not at this level. But one win makes a champion? Or imagine one win each now, and five draws, then a rapid play off. Just imagine Capablanca or Botvinnik or Euwe or Petrosian playing rapids, or blitz???? This is hardly new opinion. Its all been said many times before, in recent years, but particularly this time bears repeating. 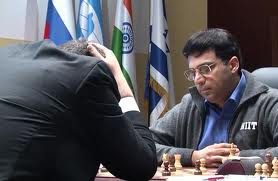 Lastly, taken far enough, no less than GM Seirawan, author of the Prague Accord (unification of the WCC) says that at least sixteen games are needed, if not twenty four. Just like the old days. Grind it out. A real test of strength, where superiority is demonstrated over a sustained period. But single or a pair of games making a winner is just too much randomness. Gaussian noise. The butterfly affect.